August is the month when the kids head back to school, teachers get back to work, and college students get ready to spend countless hours in the library again. Even though I've been out of school for almost six years, it doesn't mean that I get any less excited about the end of summer. It's a great time to check in on your New Year's resolution, one-word resolutions and establish mid-year goals like getting organized. It's also a great time of year to pick up a new planner! Who doesn't love new office supplies?! I snagged my planner from May Designs when they were having a sale at the end of July and I stock up on the Cambridge circle-the-date notebooks anytime I see them at Target. I'll be the first to admit that I've found it challenging to establish a routine when it comes to keeping organized as an adult. I sit in front of a computer for nine hours a day that unlike in school, isn't my own personal laptop. Since I can't utilize the computer for personal use, I've tended to flip flop between different types of planners and calendars (both digital and paper) but can never seem to stick to just one method. Over the summer I've settled into a routine that seems to work for me that utilizes a paper agenda for planning and my digital calendar for scheduling. 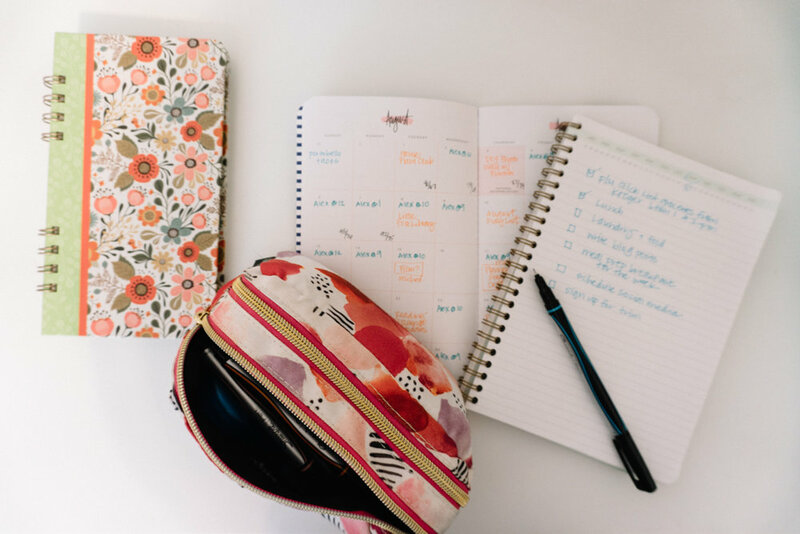 Here are a few tips for keeping organized as an adult! I've recently added an Apple Watch to my collection of gadgets and I'm loving how easy it is to set reminders, check in on my fitness goals, and access my calendar throughout the day without picking up my phone. Because it syncs so well with all my Apple my devices, I've started using iCal again instead of the Google Calendar app. The Monthly calendar spread is my favorite place to plan out my monthly blog post topics and keep track of bill due dates, weekend travels, holidays, and birthdays. I always turn to the monthly view when I need to see what is happening at a glance. In addition to keeping major events on the monthly view of my calendar, I schedule our meals in the weekly spread. I will also pencil in the day's blog post topic in the weekly view. I use a separate notebook to schedule my daily to-do list. I have found that it helps me to actually schedule my time in my calendar by the hour when I get busy. That way, for example, I know after work from 5-6 p.m. I'll be busy finishing up the grocery shopping, taking a walk from 6-7 p.m., eating dinner around 7:30 p.m. and then have time afterward to work on various chores, reading, watching YouTube videos, scheduling social media posts, etc. I keep separate digital calendar categories for work-related events, personal events (e.g. concerts, weekend trips, and doctor's appointments), my husband's work schedule, my sister's school schedule, and my blog / social media. I also use my calendar and reminders to keep track of when bills are due and when I should make our monthly payments. It's so easy to set up reoccurring events and reminders on the iPhone's built-in calendar. Using apps like IFTTT and Buffer, I am able to automate a lot of my work for the week. You can use IFTTT to create an event every time you add a reminder on your iPhone, add the forecast to your calendar track your work hours or trips to the gym, and so much more. I started using Buffer this summer to schedule my Twitter and Facebook Page posts each time I blog. I use Evernote and the notes app to keep track of the random ideas that pop in my head, create lists of hashtags by category for Instagram, and type up my grocery shopping lists. I occasionally also use the Clear app because it's simple and convenient if I don't have a physical notebook stashed in my handbag. What are your favorite apps that help you keep on-task during the week?